Antes e depois com os The Parrots | Watch and Listen! Os The Parrots voltaram a Portugal. Antes do seu concerto no Musicbox, assistimos ao soundcheck deles e fizemos um jogo com eles que apelidámos de "True or False". No jogo, cada membro da banda viu algumas imagens e frases, e depois teve que dizer aos outros se o que estava a ver era verdade ou não. Vejam o vídeo "Before and after: The Parrots" com imagens do soundcheck, um jogo e imagens do concerto no Musicbox. 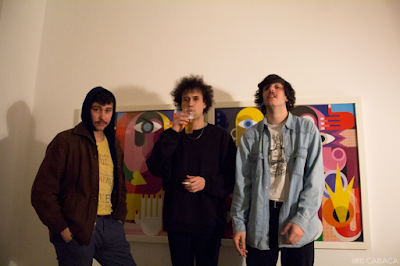 The Parrots came back to Portugal last month to play at Musicbox. Before the show, we saw their soundcheck and they played a game called "True or False". Each member of the band saw a few images and sentence and he had to tell the others what he was seeing and if it was true or not. Watch the video below with images of their soundcheck, a game and images of their show at Musicbox.